QHA Series broadband omni-directional RHCP or LHCP quadrifilar helix antennas are rugged all weather model, enclosed in a ABS radome, uses high class copper alloy and does not require any field tuning or adjustments. The compact size of RHCP omni or LHCP omni-directional quadrifilar helix antenna allows easy handling, shipping and highly suitable for receiving, transmitting, scanning, monitoring, surveillance and jamming applications. The QHA circular polarized omni antenna comprises two bifilar helical loops oriented in mutual orthogonal relationship on a common axis. The terminals of each loop are fed in anti-phase and the currents in the two loops are in phase quadrature. QHA Series RHCP omni or LHCP omni antennas are high suitable as base station antenna for Ground To Air communication application without having the requirement of multiple antennas. 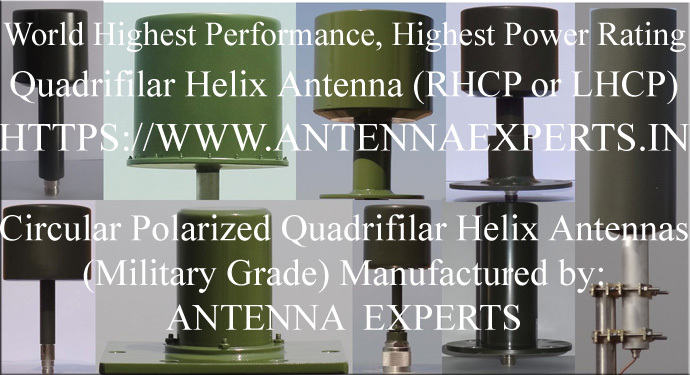 The RHCP omni quarifilar helix antenna or LHCP omni quadrifilar helix antennas are consisting of two pairs vertical loop radiating elements at right angles to each other, twisted into helix turns vertically and enclosed in ABS radome. The special “Teflon Dielectric Transmission Line” technique is used to handle high power handling capacity allowing smooth VSWR and good gain over the specified frequency band. The UV resistant ABS enclosure has excellent transparency for RF signals and enough strength to withstand specified wind loads. The stainless steel mounting hardware is supplied with the antenna. Cylindrical shell/enclosure is used for low wind loading and for minimal effect of ice formation on the antenna operation as well as providing an aesthetically pleasing appearance. QHA-1117 broadband hemi omni-directional LHCP hemi omni quadrifilar helix or RHCP hemi omni quadrifilar helix antenna is rugged all weather model, enclosed in a ABS radome, uses high class copper alloy and does not require any field tuning or adjustments. The compact size of LHCP or RHCP omni-directional quadrifilar helix antenna allows easy handling, shipping and highly suitable for receiving, transmitting, scanning, monitoring, surveillance and jamming applications for GPS L1, GPS L2, GPS L3, GPS L4, GPS L5, GPS L6, IRIDIUM, GLONASS, and INMARSAT bands without having the requirement of multiple antennas. The antenna is also highly suitable for Ground to Air communication/jamming application due to its wide elevation beamwidth with omni-directional properties. Antenna termination fitted just below the NATO mounting flange for complete weather protection. Other type of mounting hardware / configuration can be supplied on request. QHA-1726 broadband omni-directional LHCP omni quadrifilar helix or RHCP omni quadrifilar helix antenna is designed to cover the entire 1700-2600MHz, and rugged all weather model, enclosed in a ABS radome, uses high class copper alloy and does not require any field tuning or adjustments. The compact size of LHCP or RHCP omni-directional quadrifilar helix antenna allows easy handling, shipping and highly suitable for receiving, transmitting, scanning, monitoring, surveillance and jamming applications without having the requirement of multiple antennas. The antenna is also highly suitable for Ground to Air communication/jamming application due to its wide elevation beamwidth with omni-directional properties. Antenna termination fitted just below the NATO mounting flange for complete weather protection. Other type of mounting hardware / configuration can be supplied on request.